Adding designs and patterns to your next dye project is a breeze with a simple batik technique that’s guaranteed to turn some heads. 1. Using a glass bowl and a saucepan as a double boiler, heat the wax until it's melted. Safety tip: Be sure to tilt the inner container; otherwise a vacuum could form and you could receive a nasty burn. 2. Clip the clothespin to the side of the cookie cutter and dip the cookie cutter into the wax for at least 20 seconds. 3. Place the wax-dipped cookie cutter onto the scarf and press lightly until the wax is transferred to the scarf. Allow the wax to cool. 4. Mix the dye (following package instructions) in a large tub or a metal sink. Wet the scarf and place it in the dye bath; stir and let the fabric sit in the dye for about an hour. 5. Rinse the scarf in cold water until the water runs clear; hang the scarf to dry. 6. Place the fabric between pieces of kraft paper and press with a hot iron to remove the wax. 7. 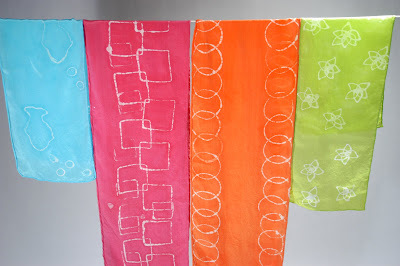 Rinse in hot water with a mild detergent to remove remaining wax, then let the scarf hang to dry. Your front door can go a long way toward making a home feel welcome, and this customized doormat is the perfect first step. 1. Print a family initial (or fun words) using a bold font and enlarge the letter so that it is approximately 6" tall. 2. To make the stencil, tape the piece of paper with the letter on it to a manila folder. Trace around the letter with a permanent marker-- the ink will bleed through the paper, leaving an outline on the folder. Cut out the letter (use a utility knife to cut out the inside of the letter). 2. Tape down the letter on the mat where you want it,placing the tape on the back of the letters. Don’t forget to tape down the inside of the letters you cut out, if you need them. 3. 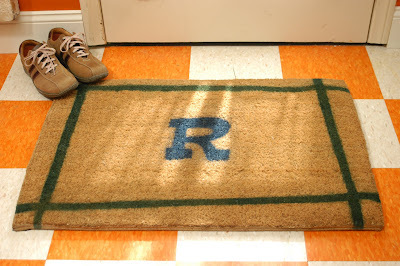 To add stripes, apply 2 rows of tape to the doormat, 2" from the top and 1" apart. Repeat this across the bottom of the mat, using a yardstick to help get the stripes straight or making the lines slightly askew. Cut away the blue tape where the lines intersect one another. 4. Tape off the rest of the mat with old newspapers, so you will get paint only where you want it. Press down firmly on the tape before spray-painting to ensure that it has adhered to the mat. 5. Working on old newspapers and in a well-ventilated area (outside is best), stand above and at least 12" from the doormat and spray-paint the mat, being careful not to get the paint under the taped area (standing directly above the mat works best). Allow to dry, then remove tape. Photo albums make great gifts, and making them yourself adds a personal touch that your friends and family will really appreciate. 1. Glue the batting to the front of the album. Trim around the edges of the book to remove any excess batting. 2. Begin with clean and pressed fabric. Lay the fabric wrong side up and position the opened book right side (batting side) down on top of the fabric. 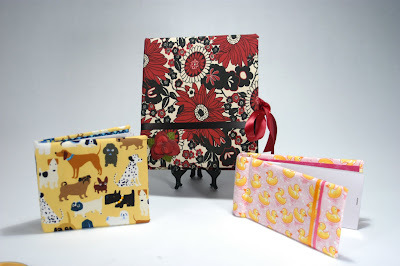 You'll need to place the book 2" from the edge of the fabric (this allows the fabric to wrap around the notebook). 3. Trim the fabric around the notebook, leaving a 2" border. Apply a bead of glue to the inside corner edge of the notebook and begin at the corners by pulling the material over the corner edges of the notebook cover. 4. Apply a bead of glue around all the edges of the notebook and pull the material over the edge. Note: Make sure you fold up the notebook at the center, because it takes more fabric than you think to make your way around the spine. When you reach the spine, depending on the notebook, you may have to trim away a bit of the fabric. 5. Measure the inside covers (as close to the edge as possible) of the notebook and cut the cardboard to that measurement. Iron the fusible webbing to the back of the extra fabric (you'll need enough to cover both pieces of cardboard). Lay the cardboard on the webbing and trim around it, leaving a 1/2" border. Attach the fabric to the cardboard by using a hot iron and first pressing the top of the fabric to the cardboard, turn the cardboard over and press the edges of the fabric over the edge of the cardboard. 6. Use hot glue to attach the fabric-covered cardboard to the inside of the notebook. 7. Use hot glue to add additional details or embellishments to the front cover of the book: silk flowers, name plaques, ribbons -- the sky's the limit. Love your show! I don't get DIY, but I get HGTV. I've seen almost every episode. Oh I can't wait to try out the batik Scarf!!! I love that look.